n many ways, Parrot is to drones what Nintendo is to video games. 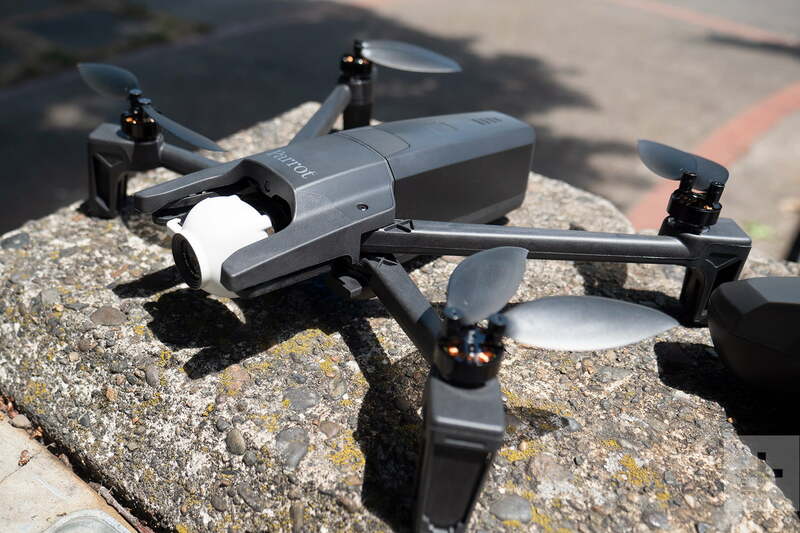 Despite playing a pioneering role in bringing drones to consumers, Parrot has always leaned a bit more to the playful side of the spectrum, often overshadowed by competitors when it comes to performance and practicality. While DJI and Yuneec were busy making drones with 4K cameras and environmental sensing abilities, Parrot pumped out drones that could do backflips, shoot foam pellets, and get tossed around like frisbees. The company’s latest drone is a step in a different direction. Anafi, as it’s called, is not only a departure from the company’s dance-themed naming convention (which brought us the Bebop, Swing, Mambo, and Disco drones) but also a triumphant departure from the casual side of the UAV market. This drone was built from the ground up for aerial photography and videography, and after putting it through its paces for the past few weeks, we’re convinced it deserves a spot at the big kids’ table. This is a drone built to travel. 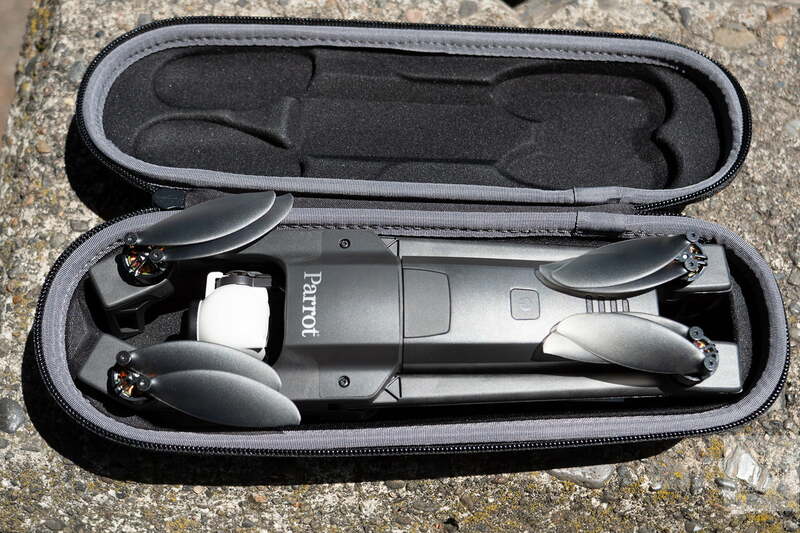 Like DJI’s popular Mavic line, Parrot’s Anafi is equipped with hinged arms that fold inward, allowing it to slip inside a pill-shaped carrying case that’s no bigger than a water bottle. It definitely won’t fit in your pocket, but the average backpack or purse should have more than enough room to hold it. The rest of the drone’s standout features are less obvious to the naked eye, but no less important. Arguably the most notable of these is the camera assembly. Nestled inside a vibration dampened three-axis gimbal, you’ll find a 4K camera capable of shooting HDR video — a feature that allows the drone handle high-contrast scenes more effectively. This camera is also equipped with lossless digital zooming abilities and 180 degrees of tilt freedom. These three features — HDR, zoom, and 180-degree tilt — are all things you simply can’t find on other drones in this price range (at least for now). 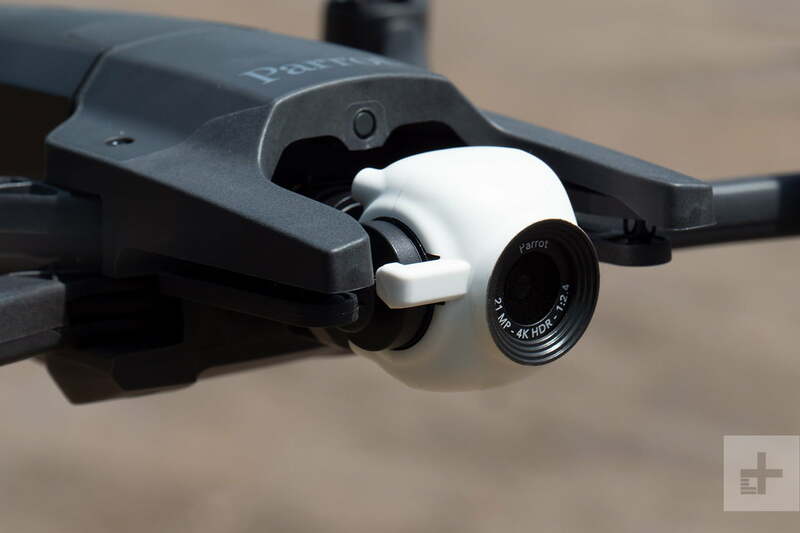 Anafi is also outfitted with a range of smart filming and flight modes. Many of these are standard fare for drones in 2018, like auto-follow, orbit, and waypoint flying. Others, like Dolly Zoom, Hyperlapse, and Slow Motion, are more unique. 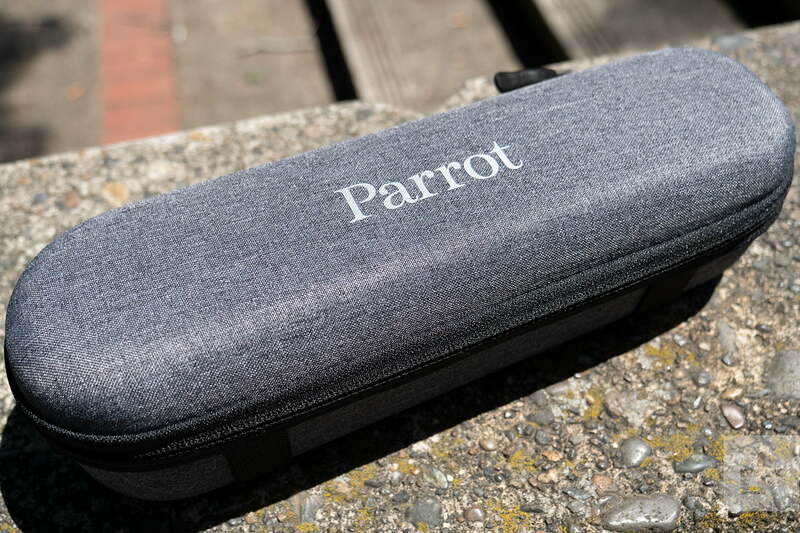 Parrot also included a handful of small, thoughtful design elements that help round out the package: a launch-from-hand function, 3D mapping software, a USB-C battery that can also be used as a smartphone charger, and the ability to fly the drone without a controller. The Anafi brings no single game-changing, must-have feature to the table, but it does bring a lot of smaller, fresh ones. If the Anafi is anything, it’s unique. Building a drone is a delicate dance: Manufacturers have to give the drone strength and sturdiness without making it too heavy — which is easier said than done. Strike the wrong balance, and you end up with a lightweight drone that’s too fragile, or a sturdy drone that’s too hefty. The key is finding a good middle ground. Historically, Parrot’s drones have leaned a tiny bit toward the fast-n-flimsy side of the spectrum. The Anafi is no different. It’s very well built, but definitely not quite as sturdy as DJI’s Mavic drones. The arms are more flexible and thin in comparison, but that’s not necessarily a bad thing. Based on our experience with earlier Parrot drones, this flexible design often makes drones very resilient and able to bounce back from crashes. It’s more willow, less oak. Parrot equipped the Anafi with a 7.6 volt, 2,700mAh battery lithium-polymer battery, which allegedly provides 25 minutes of flight time on a full charge. That’s what’s printed on the box, but as usual, this spec is based on ideal flight conditions and isn’t necessarily a reflection of real-world performance, so we put it to the test. In a static hover endurance test (in which we send the drone up with a full battery and let it hover in place until it comes down for an automated emergency landing), Anafi managed to stay airborne for just shy of 23 minutes — which is pretty damn good for a drone of this size. Of course, flying around and making full use of the drone’s motors and processors drains the battery a bit faster, but even during our more rigorous flight tests, Anafi still managed to stay skyside for an average of 21 minutes. Compared to other portable drones, that’s pretty great. 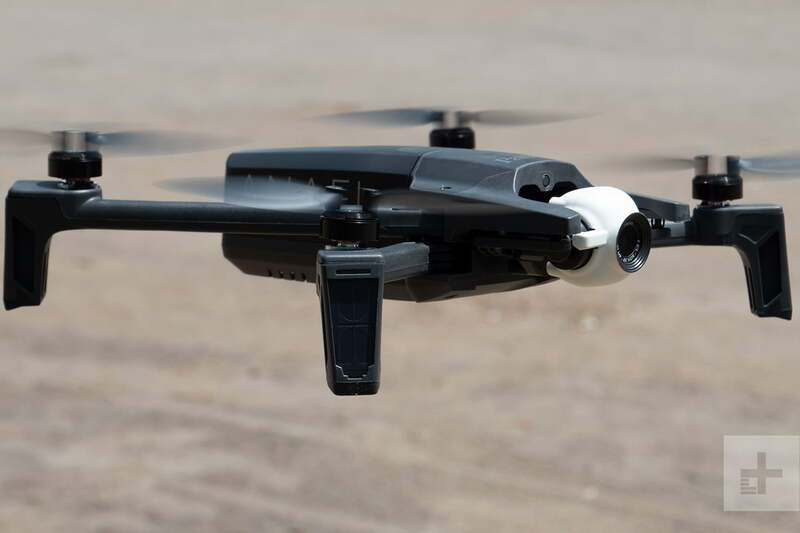 Yuneec’s Breeze can only manage about 12 minutes on a single battery, while the Hover Camera Passport can only hang for about 10. Even Anafi’s most formidable competitor, the DJI Mavic Air, can only stay aloft for 18 minutes. When it comes time to recharge, you can expect anywhere from 1.5 to two hours to get from zero to 100 percent. It’s worth noting, however, that charge time is very much dependent on your charging setup. Anafi juices up via a USB-C charging port, which means you can charge your battery practically anywhere – but keep in mind not all USB chargers are created equal. The cheap one you plug into your car’s cigarette lighter puts out less juice than the one that came with your iPad, and charge times will vary accordingly. Using the Anafi is a breeze on just about every level — and we’re not just talking about flying. The first thing we were struck by was how simple the pairing process is. With most drones, you have to wait a few minutes for your phone to connect to the drone, and then wait for the drone to connect to all the satellites it uses for positioning. Somehow, this process is nearly instantaneous with Anafi. As soon as you fire up the controller and plug it into your smartphone, you can start flying — and there’s something to be said for that kind of immediacy. The controls are nice and responsive, but not quite as tight and athletic as DJI’s drones. There’s a tiiiny bit of lag between user input and drone output, which makes the controls feel just a smidge on the slippery side. Let off the sticks, and there’s a brief but noticeable pause between when you relinquish control and when the drone comes to a stop. This certainly isn’t a dealbreaker, and it only takes a minute to adapt to — but it does diminish your confidence as a pilot. We definitely flew more cautiously with this bird as a result.Update: after the latest firmware update, Parrot seems to have fixed the control lag issue. Joystick motion translates almost instantly into the corresponding drone movement, which leads a much more predictable flying experience. You can fly Anafi with confidence. In terms of autonomy, Anafi performs admirably in most areas. Its automated flight modes all work exactly as advertised, while the automated filming modes produce consistent and reliable results. That said, it’s worth noting that Parrot’s auto-follow technology isn’t quite as robust as what you’ll find on a DJI drone. We found ourselves longing for obstacle avoidance software while we nervously zipped through the trees. One thing that’s notably absent on this drone is obstacle avoidance — which now comes standard on many UAVs in this price range. When it comes to environmental sensing, the Anafi is only equipped with a ground sensor, which effectively means it can’t sense and avoid obstructions like tree branches or power lines. Again, this isn’t necessarily a deal breaker, but it does force you to fly a bit more cautiously. We found ourselves longing for obstacle avoidance software while we nervously zipped through the trees at our local park. The Anafi’s camera setup is the star of the show. Pretty much every other feature on the drone is something you can get elsewhere, but Anafi’s shooter is where Parrot packed in all the goodies that differentiate this drone from the rest of the pack. In terms of raw specs, Anafi boasts a 1/2.4-inch CMOS sensor from Sony, along with a wide-angle f/2.4 ASPH lens. In addition to 21-megapixel still shots, it can shoot video in 1080p FHD at up to 60fps, 4K UHD (3,840 x 2,160) at up to 30fps, or Cinematic 4K (4,096 x 2,160) at 24fps. It’s also equipped with an HDR mode, which essentially just boosts the camera’s contrast and allows you to capture good-looking footage even if the scene you’re shooting contains both bright and dark areas. Parrot has leaned on this feature pretty heavily in its promotional efforts, but in our opinion, HDR isn’t the drone’s most significant feature. What really won us over with this drone was the camera’s motion capabilities. In addition to lossless zooming, the Anafi’s camera also has 180 degrees of tilt freedom, meaning it can look straight down OR straight up — which makes it really fun and flexible to film with. Having the ability to look up, down and zoom while flying ultimately gives you a greater degree of creative freedom, and allows you to capture shots that you simply can’t get with other drones. This is unquestionably the best drone that Parrot has ever made — but there are a few things holding it back. Most notably, the sluggish controls and lack of obstacle avoidance detract from the flying experience, and ultimately force you to fly more cautiously. However, Anafi makes up for its control shortcomings with a stellar camera assembly that provides a fun, dynamic, and creatively liberating filming experience. The drone’s zooming and tilting abilities, along with its unique filming modes, make the Anafi a standout in the portable drone category. If you value flight performance and reliability more than taking pretty pictures, then you’d be wise to consider DJI’s Mavic drones. They’re more responsive, and are equipped with powerful obstacle avoidance that lets you fly with confidence — so if you’re not the most seasoned drone pilot, we suggest you go with DJI. All things considered, we do think that DJI’s Mavic Air is an overall better drone than Anafi, but not by a huge margin. 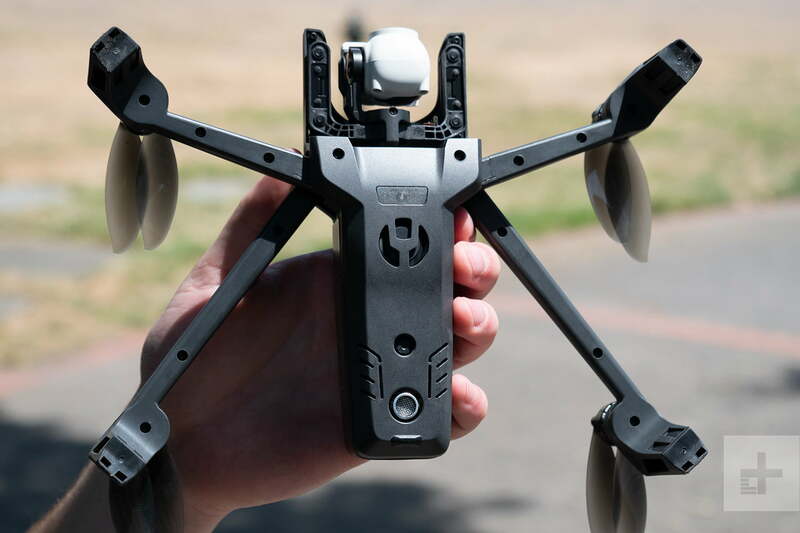 It has better flight controls, a solid camera, and is extremely portable — but it also costs $100 more. Years. Parrot released the Bebop 2 drone almost three years ago, and it’s still releasing firmware patches and app updates — so there’s no reason to believe it won’t do the same thing with the Anafi. As long as you can avoid catastrophic crashes, this drone should keep on buzzing for years to come. Yes. Despite a few minor shortcomings, the Anafi is a great little drone that’s an absolute riot to play with. You won’t regret this purchase.